After successfully applying for government funding to aid with the installation of fast-charge points for electric vehicles, the Flintshire based North Wales Truck Stop (adjacent to Dandy’s Topsoil), will begin implementing the project later this year. The charge points will be made available to anyone visiting the Flintshire area and to those already in the area who may run electrically operated vehicles. "We’re really proud to be the first business in North Wales to have fast charge points available for public and private sector use." The fast-charge points reduce the charge time of environmentally sound electrical vehicles by up to 80%, meaning that a car can go from empty to full in as little as half an hour. Dandy’s Topsoil - parent company to the North Wales Truck Stop - already has two 100% electric Mitsubishi i-Miev cars in their fleet which they currently charge on standard points. At present a full charge can take anything up to 8 hours from empty which has a serious negative impact on the usability of the cars in general. It is hoped that, with the new charge points in place, the company will be able to use the cars more and more throughout the day, enabling longer journeys in the cars and reduced fuel bills via less usage of petrol and diesel cars within the company. The electric charge points will be a welcome addition to the already thriving North Wales Truck Stop which has so far proven to be extremely popular with truckers and members of the public looking for a pleasant place to rest on long journeys via Flintshire. 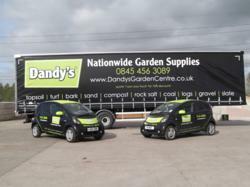 Dandy’s is a multi-award winning business and has been family run since its beginnings in 1826. As an environmentally conscious business, Dandy’s are always looking for ways to actively reduce their carbon footprint. In 2007 they were awarded ‘Flintshire’s Environmental Business of the Year’ award for work carried out to divert thousands of tonnes of material from landfill and were finalists in the same category in years since. Often at the forefront of their market, the business has seen great success in the production of products such as Ultragrip® Rock Salt, which saw Dandy’s as the only company in the UK able to supply businesses, home-owners, Councils and the emergency services with a de-icing product after salt mines closed in the winter of 2009/2010.